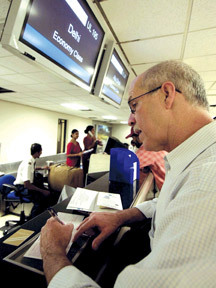 India constitutes a big market with a growing middle class who creates an increasing demand for travel and tourism. This provides a major source market for Sri Lanka’s tourism industry, provided that the tourism industry is set to capitalize on the opportunity that it has within close proximity by recognizing the specific features of the Indian tourists. Colombo University Economics Professor Dr. Sirimal Abeyratne made this remark presenting his research findings on the issue at the Sanvada Seminar of the Pathfinder Foundation, held at the Sri Lanka Institute of Tourism and Hotel Management on June 9. The seminar was completed on a timely and well researched analytical study for the Pathfinder Foundation, the economic think-tank on the Indian tourism market. This study includes a detailed analysis of the current status and characteristics of Indian tourist arrivals in Sri Lanka, and identifies a number of benefits from further promotion. The seminar was chaired by Lirneasia Executive Director Dr. Rohan Samarajiva, while Tourists Hotels Association of Sri Lanka President Anura Lokuhetti and Jetwing Chairman Hiran Cooray made presentations. According to Prof. Abeyratne, Sri Lanka attracts only about 1 percent of over 11 million Indian tourists whose attractive tourist destinations are Singapore, China, Thailand, Hong Kong and USA. These countries attract ‘high income’ and ‘upper-middle income’ tourists, while Sri Lanka caters to the Indian tourists from the ‘lower middle’ income groups. Indian tourists are different from the Western tourists in terms of tourism interests and purposes, seasonal variation of arrivals, tourist nights spending and tourism expenses. By identifying the importance of this growing market and its special characteristics, Sri Lanka should create a differentiated tourism product market, adopt simple and clear immigration procedures and develop regional ‘entry points’ by air and sea in the Northern part of Sri Lanka. In addition, Indian tourism is associated more with business, shopping, and other purposes than with leisure. According to Prof. Abeyratne, it is important to create a tourism sector that caters divergent tourism interests and strengthen economic integration with India. Tourist Hotels Association of Sri Lanka President Anura Lokuhetti, elaborated the importance of the growing Indian economy and its middle class who creates an ever-increasing demand for travel and tourism. 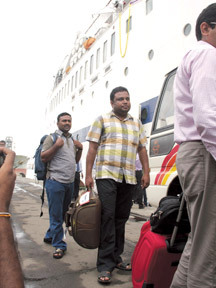 As India is projected to have over 50 million outbound tourist departures by 2016, according to Lokuhetti, given the close proximity Sri Lanka has the potential to become a major tourist destination for Indian tourists. Jetwing Chairman Hiran Cooray highlighted the importance of learning how to cater the Indian tourists as the Indian tourists are a highly diverse group which requires designing differentiated tourism products to cater to all of them. He also stressed the potentials that Sri Lankan tourism industry possesses to cater the big Indian market, but as at present Sri Lanka caters only to its lower-end tourist market. By wrapping up the Sanvada seminar, the Chairperson Professor Rohan Samarajiva, Lirneasia Chairman, pointed out the importance of ‘Patel Points’ in USA, UK and many other countries which provide a memorial attraction to the Indian tourists. In Sri Lanka, there is hardly any ‘Patel Point’ that attracts Indian tourism. The Sanvada seminar is aimed at studying the importance of Indian tourist arrivals for the tourism development of Sri Lanka with inputs and comments from the resource persons to feed into a policy debate. The final outcome of the event is to prepare a Policy Brief which will be distributed among the Parliamentarians, policy makers, and other government and non-government agencies in guiding the policy formulation.